I started by following the guide books directions but it was fairly well signed and the signs didn't always tie in with the guidebook's directions so I decided to just follow the signs and refer to my map on Pocket Earth. It is a seriously fantastic application and I am a little addicted to the geolocate function which uses my iPad's GPS to show me exactly where I am on the map. It means I can make mistakes and go the wrong way but cannot get lost as all I have to do is geolocate myself and track myself back or forward back onto the path. That is why I wrote lesson number 6. 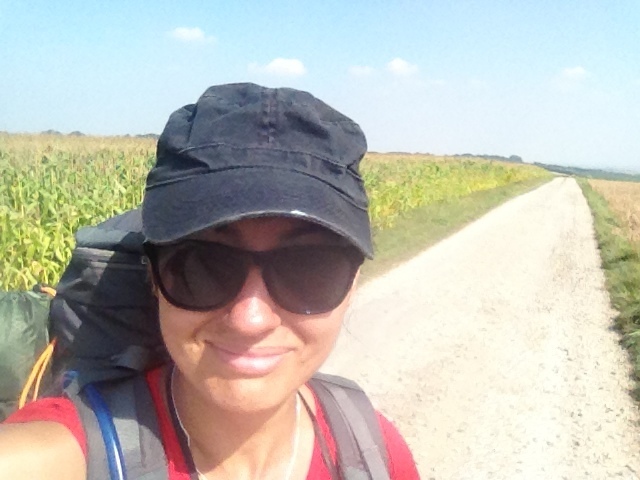 I have been worried about getting lost, that it means I will have to walk further than planned which will mean more physical pain or I will have to actively seek out assistance and endure the difficulties of language barriers. But when I remember back two years ago to Tuscany, it was the getting lost where most of the jewels were found. As Guines has limited accommodation, I already knew that I would be camping at La Bien Assise. I just didn't know where it was and actually couldn't find it on my map, as good as it is for finding my way it doesn't have all the street names. So I prayed there would be a sign and there was. As I approached Guines, there was a very large sign pointing the way to the town centre and an arrow pointing north east showing La Bien Assise. I walked straight into the camp site to the reception where I was given a camp site for free as a pilgrim and was even driven over to my campsite away from the noisier camper vans and all by myself. I set up my tent for the first time with relative ease. Rolled out my sleeping bag and lay my spare clothes under it for some padding. As physically tired as I was, I could not sleep. I tossed and turned for hours. It actually felt good to have the hard earth beneath me as it stretched out my tight and aching muscles but as the night grew deeper it got colder. I kept adding layers of clothing and still felt cold. When I finally fell asleep, I dreamed someone opened my tent and was trying to pull me out by my foot and later of all sorts of murders being committed right in front of me. I wanted to get up at 7am and get going before it was hot but exhausted, I fell into a deep sleep and woke up at 8am. Slowly and carefully because everything was damp and the outside of the tent covered in dew, I packed my belongings back into The Devil and commenced my day's walking at 9.30am.